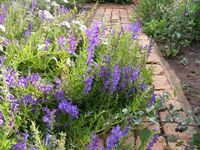 Low growing perennial herb with spear-shaped leaves and stems spreading along the ground and then turning upwards at the tips. Dense, one-sided racemes of hairy, tubular, bluish-purple helmet-shaped flowers are produced in summer. Drought tolerant once established and it needs full sun to shade. Although it has a bitter taste, the leaves can be eaten as a vegetable or dried and used as a tea substitute. Only the root of three or four year old plants must be harvested. One of the 50 fundamental herbs used in traditional Chinese medicine for anti-inflammatory and anti-cancer therapy. Anti-allergic - research has shown that the flavonoids in Scutellaria baicalensis are helpful in treating allergies and respiratory conditions, such as food allergies, allergic edema, asthma, nettle rash, eczema, hay fever and otitis media. Also prevents inflammation in the body from these allergic reactions and inhibits prostaglandin production and histamine release. Therefore it is often used to treat fevers, coughs, diarrhea, urinary conditions, allergic rhinitis, and wheezing. Anti-bacterial, anti-microbial and anti-inflammatory - treats acute infections, auto-immune diseases, chronic infection, retroviruses, e.g. herpes, HIV, inflammatory bowel disease, ulcerative colitis and Chrons disease. Anti-coagulant - prevents the formation of clots in the blood. Antioxidant - contributes to the oxidation of free radicals which are believed to contribute to premature aging and dementia. Bitter and cold - Scutellaria baicalensis is applied to bitter tasting drugs which act on the mucous membranes of the mouth and stomach to increase appetite and promote digestion. It clears Heat in the lungs and drains Wet Heat of the stomach, intestines, liver, and spleen. It also drains Wet Heat of the Lower Burner with painful urination. Diuretic - increases the volume and flow of urine which cleanses the urinary system. Sedative - mild, soothing agent that reduces nervousness, distress or irritation. Vasodilator - widens the blood vessels and lowers blood pressure. It inhibits collagen and arachidonic acid induced platelet aggregation, cardiovascular conditions and atherosclerosis. Treats metabolic conditions like cataract and diabetes complications. Pregnancy, abnormal fetal movements, toxemia in pregnancy. Warnings: not for use by insulin-dependent diabetics.